Mutton Lazeez – Mild melt in mouth mutton. Mutton Lazeez. Literally translates to delicious mutton, it is a dish of melt in mouth mutton cooked in mild spices, mixed in yoghurt and cream. A mildly fragrant creation that will make you a star chef with very little work. Just keep these two tips mind, #1 Don’t go overboard adding masalas even if the quantity mentioned appears less. #2 Don’t let the yoghurt split when you add it. This is a mughal era recipe so traditionally mutton lazeez or gosht lazeez is cooked in handi, but you can very easily make it in a pressure pan. I must say however, that cooking this in a handi will give make it even more flavorful. Heat ghee in a pressure pan add bayleaf and onions. Saute till they are translucent and, add mutton followed by ginger and garlic. Fry till mutton is well browned and add the prepared spice powder along with red chile powder. Fry for a few seconds and add tomatoes. Add salt. After the pressure drops, keep the pressure pan again on the stove and check the mutton for tenderness. If the mutton pieces are too tender, remove them from the curry so they don't break. 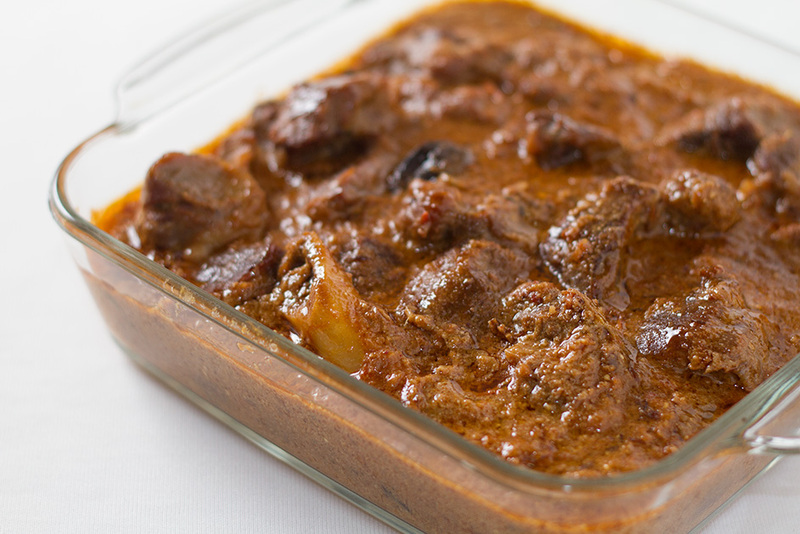 Serve this Mutton Lazeez with Tandoori Roti and Rice. A handi is a deep, wide-mouthed cooking vessel used in north Indian, Pakistani and Bengali cooking. Because there are many specific Indian and Pakistani dishes cooked in this vessel, their names reflect its use, such as handi gosht, handi biryani, handi chicken etc. Handis resemble American beanpots, French soupières, and Mexican and Spanish ollas. They are used similarly. My husband’s favorite mutton recipe!! Bookmarking your recipes using the kitchenbug bookmarklet isn’t working very well. Any idea? The Markup validates perfectly for Recipe as well as hrecipe. See https://developers.google.com/structured-data/testing-tool?url=http%253A%252F%252Fswatisani.net%252Fkitchen%252Frecipe%252Fmutton-lazeez-mild-melt-in-mouth-mutton%252F Which leads me to think that the parser at Kitchenbug needs some tweaking.